What exactly is the grand plan that is going to result in the disintegration and destruction of ISIS? On Tuesday military chiefs from 22 of the 60 countries making up the coalition fighting against ISIS (including five Arab countries) met in Maryland to discuss the way forward with the campaign. According to reports, the meetings proved once again that although there is a united aim amongst the coalition parties to see ISIS eliminated, once you move beyond that initial goal there is very little that binds them together, nor is there a coherent strategy. Serious divisions remain, particularly over the coalition’s plan for Syria and whether the current methods of military engagement will strengthen or weaken President Bashar al-Assad in the long run. There is plenty of talk of air strikes and arming the defending forces, but if anything should have been learnt from the recent campaigns in Iraq and Afghanistan, it is that military might alone can no longer produce stable conclusions in the way we had grown to expect in the 20th century. Wars against jihadist terrorists require a significantly different approach, and our politicians and military commanders have shown over the last few years that they have limited answers. If we are to see lasting victory over ISIS and other Islamist terrorist groups, new approaches will need to be forged and adopted. Strategy must be global. The emergence of ISIS has been a wake-up call. The attacks on religious and ethnic minorities, Christian and others, have been getting rapidly more severe (across the globe). Even where there is no violent conflict there is struggle and persecution. In September a group of Indian Christians meeting privately in Saudi Arabia, simply to worship, were raided and arrested. In the United Kingdom, mosques and synagogues have been attacked. Freedom to worship, or to hold no faith, must be upheld. It has been international law since the Universal Declaration of Human Rights. The road is short from intolerance and hostility to persecution and atrocity. This struggle is not simply a religious conflict, but a terrible mix of ethnicity, economics, social unrest, injustice between rich and poor, limited access to resources, historic hatreds, post-colonial conflict and more. It is impossible to simplify accurately. We cannot tolerate the complexities and so we seek to hang the whole confusion on the hook of religious conflict. And because even to do that on a global scale is complicated, we focus on one area, at present Iraq and Syria, while others—Sudan, Nigeria and most recently Israel and Gaza—are forgotten. Or, equally dangerously, we deny it is religious, in the illusion that religion makes it unfixable. We saw in the aftermath of the second US-led invasion of Iraq that Western leaders had not grasped the full nature of the beast they had sought to defeat. Terrible mistakes were made as they realised, too late, that simply toppling Saddam Hussein and his power structures would unleash a host of regional powers, tensions and ideologies that had previously been suppressed. Western secular thinking has proved to be inadequate against these forces as the intricate issues continue to be oversimplified and misunderstood. Welby rightly points out that, unlike democracies with a Christian heritage where church and state are usually separated, in the Islamic world state and religion are seen as a single entity. Many of the failures of response stem from these contrasting cultural and historical perspectives. These are not just political conflicts: they are both political and religious, and an effective response must mirror this. Force alone will never bring about peace of any substance. When we bomb ISIS fighters, we may not see this as an act of religious aggression, but ISIS certainly do. Until we and our politicians begin to understand effectively what is going on in the minds of our enemies, we will be unable to find solutions that have the potential to work. What is worse, if we do not accept the deficit of our understanding, we deceive ourselves and, as Welby puts it, “deceit leads to the same nightmares that engulfed the world after 1914”. Strategy must aim for a just peace, not only our stability and prosperity. The creation of international structures that promote peaceful confrontation is one of the greatest achievements since 1945. Yet too often they break down. An effective strategy requires as its foundation the ideals which were so influential after 1945 in Europe and Japan. We are not fighting for economic prosperity and a second overseas holiday every year. That weighs little against an ideal, however perverted, of eternal salvation through jihadist killing. Our struggle is for the ideas of human flourishing both now and eternally, of mutual love and respect, of diversity handled in amity not enmity. There is a need for practical precision on what that means. What does the end of this struggle look like? It must include a review of those aspects of our own culture and lives that rest in power and self advancement and not in love for neighbour. That touches on systems of trade, international finance, and the exercise of power. We all know that violence by itself resolves nothing. Any global struggle with aims of human growth and development, of a just peace and not only on the terms of the rich and powerful, requires a different spirit. For Christians it is ultimately through following the example of Christ’s self-giving love that we may save ourselves and others. This “different spirit” is the key to Welby’s thinking, and it is not one that can be entrusted to our politicians. Whether we choose to accept religious belief or not, it does not alter the reality that religious faith and ideologies hold far more power than guns and bombs. In the first three centuries of the Church it had no armies and pitched no battles, yet it overcame the Roman Empire through love and a gospel of God’s peace. Religious leaders need to be given a place at the top table as much as military commanders. Their insights into the role of religious belief as a driving force in individuals’ lives, along with their status, hold great value and potential to change the stakes. Religious leaders must up their game and engage jihadism in religious, philosophical and ethical space. Religious justifications of violence must be robustly refuted. That is, in part, a theological task, as well as being a task that recognises the false stimulation, evil sense of purpose and illusory fulfilment that deceive young men and women into becoming religious warriors. As we have seen recently, many religious leaders have the necessary (and very great) moral and physical courage to see the need for an effective response to something that they have condemned. It is essential that Christians are clear about the aim of peace and the need for joint working and that Muslim leaders continue explicitly to reject extremism, violent and otherwise. Any response must bring together all those capable of responding to the challenge. Justin Welby talks about treasuring and preserving our values, but also of reshaping them. This would appear to be contradictory, but the context suggests that he is referring to both the values that have built peace and progress and also those that we have developed that bear the hallmarks of selfishness and self-preservation. 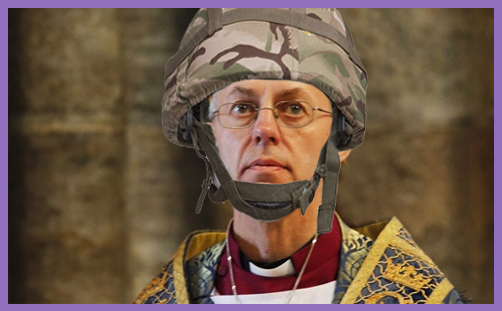 This is the battle that Justin Welby is calling for. It is a physical battle against the brutality of ISIS, but also one that is against our complacency, arrogance and indifference to religion. To bring an end to ISIS’ reign, the hearts and minds of the adherents to their corrupted ideology will need to be changed. The lessons of the past teach us that it can happen, but we on the outside will need to do more to remember and embrace the values and that “different spirit” which have brought us stability and healing from our own conflicts if we are going to be able to make a contribution beyond the provision of arms to groups we favour and a campaign of airstrikes.